Guernsey Botanical Trust announces launch of fundraising campaign to build visitor and learning centre. The Directors and Volunteers of the Guernsey Botanical Trust announced the launch of a Fundraising Campaign to raise £200,000 to build a Visitor and Learning Centre. The members of the Fundraising Committee are Lady Rowland, a Patron of GBT; Hugh Johnson, Director; Andrew Thompson, Director and Raymond Evison OBE, President and Director. Since the start of the restoration of the walled garden by Volunteers, in 2006, it had been the dream of all concerned that a Gatehouse would be built, at the entrance to the VWKG, to house a Visitor and Learning Centre for Horticulture and Heritage. Floral Guernsey gave GBT a generous donation in 2013 which helped to start the shop and the remainder of the donation had been held in reserve for The Gatehouse. The Gatehouse Campaign has now been given a fantastic start and a great boost with a marvellous donation of £10,000 from The Blue Diamond Group who are owners of Le Friquet Garden Centre in Guernsey. Mr Alan Roper, the Managing Director of Blue Diamond said: “Our company owes its existence to the growing industry when in 1904 our founding fathers, which included Geoff Dorey’s grandfather, gave birth to the Company, then known as Fruit Export. The Victorian Walled Kitchen Garden is a wonderful living example of growing from a moment in time when horticulture became the lifeblood of the islands and is forever preserved within those walls. 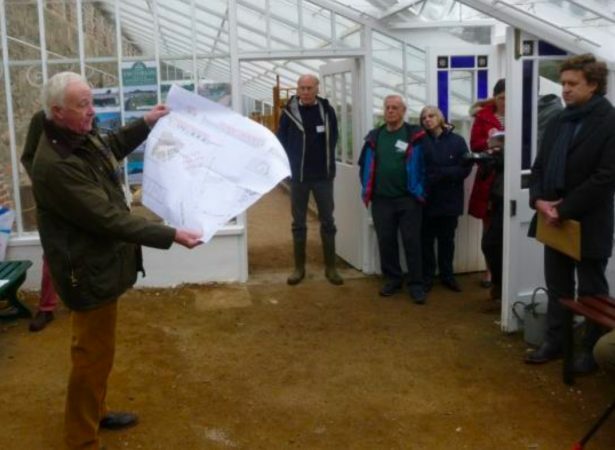 The local media were invited to visit the walled garden between 12 noon and 1pm to meet Mr Alan Roper and the Directors and volunteers of the Guernsey Botanical Trust and to see the draft plans for the Gatehouse. Juliet Pouteaux of the Guernsey Press took notes during the speeches that Raymond and Alan Roper gave whilst Peter Frankland photographed the action. Matthew Leach of Island FM interviewed Raymond and Alan Roper, followed by Louise Sayers of Radio Guernsey. Grace from Channel TV filmed Raymond entering the greenhouse, putting down his umbrella from the pouring rain and looking at the photographs which showed the stages of the development of the garden since 2006 and the draft plans for the Gatehouse. She also filmed Malcolm and Jill so it will be interesting to see, hear and read the results. Thank you to all the volunteers who were able to come to support the launch.